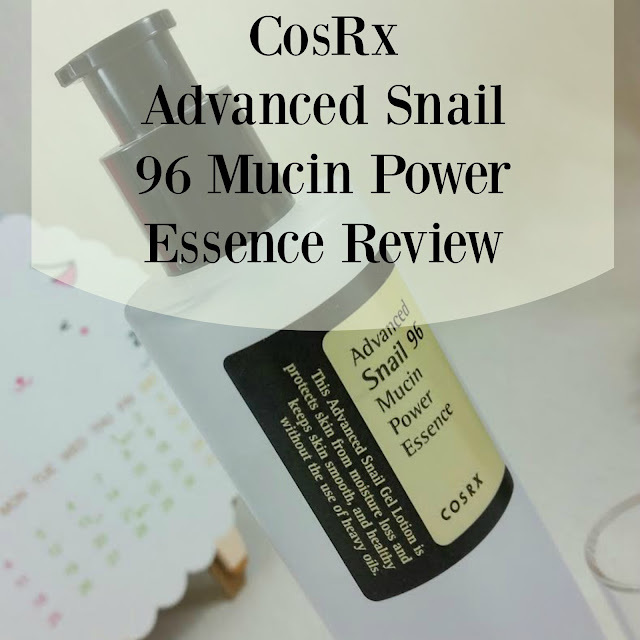 The CosRx Advanced Snail 96 Mucin Power Essence is one of the first serious products I've used from CosRx. It's convinced me that this brand knows what it's doing and I've since purchased several other toners and moisturizers. I have dry skin that tends to redden, flake and crack when I lack moisture. It's my biggest skin concern. It took me awhile to realize this because I was so used to having combination skin all my life but around 35 my skin started to change and I didn't notice. Or maybe I blamed it on other things. But it is a fact that your skin can change as you age. If you started out oily, you can become dry or vice versa or any combination therein. You can also develop skin sensitivies as you age, as well. So just when you think you've got your skin figured out... you discover something has changed. Korean skincare has been a real eye opener for me. High quality, scientifically proven ingredients with major benefits at reasonable prices? Sign me up! The Snail 96 Essence has been a true skin-saver! It has the unique texture that indicates a high percentage of snail mucin-- It's really stringy! The clear serum glides over the skin and sinks in beautifully with some massaging. 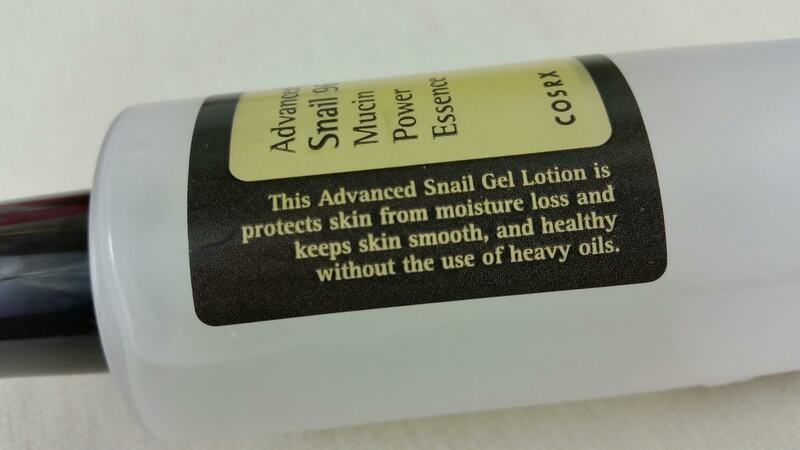 Snail Secretion Filtrate- Snail slime is naturally packed with nutrients like hyaluronic acid, glycoprotein enzymes and copper peptides while also being anti-microbial. While research has yet to prove that these stimulate collagen or elastin, we do know that this is a ridiculously good moisturizer and if any of those other goodies sink into my skin at the same time-- all the better! Sodium Hyaluronate-Sodium hyaluronate is smaller than hyaluronic acid and is able to move more easily into the deeper layers of the skin. Sodium hyaluronate is a powerful humectant that attracts and holds on to water, helping to hydrate skin. Hydrated skin is plumper and plump skin causes fine lines disappear which is why this is such a great ingredient. 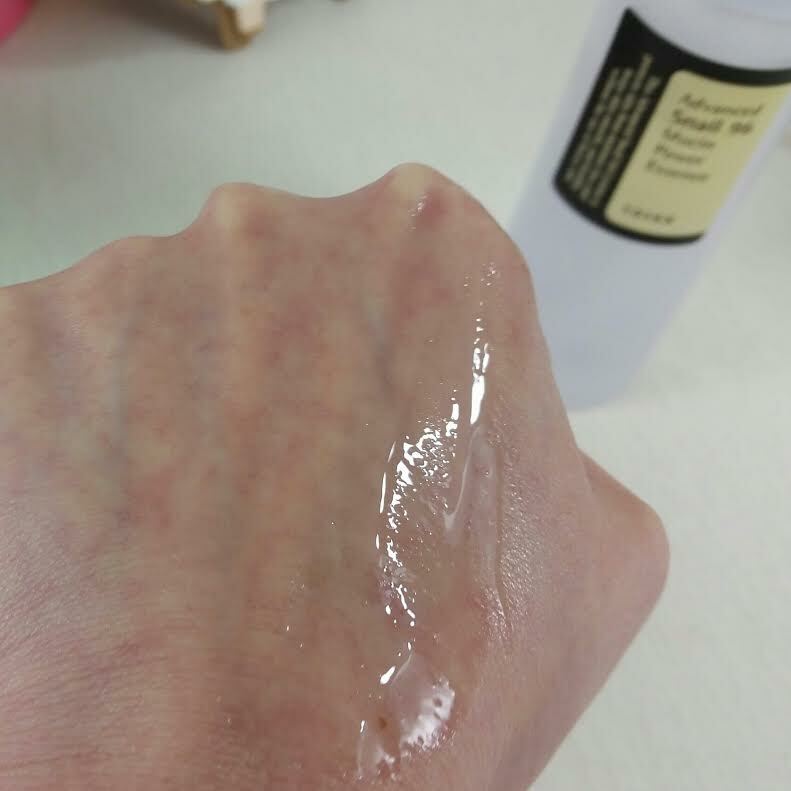 Panthenol- Panthenol is a humectant moisturizer, like hyaluronic acid, which draws moisture from the atmosphere and readily binds to water molecules. It improves hydration, has anti-inflammatory properties and is known to accelerate healing of skin wounds. 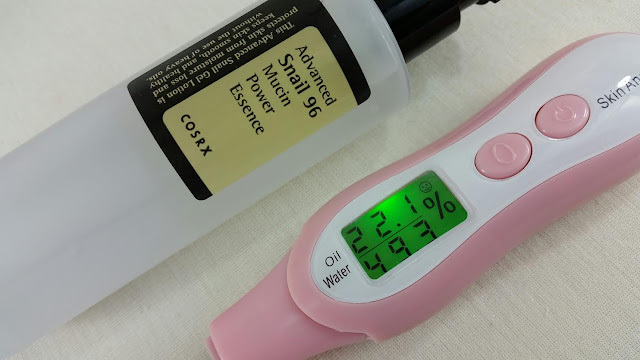 With my handy dandy skin moisture analyzer, I tested my skin both before and after application of the CosRx Snail 96 Essence. This is good but not excellent. I think 30% is the bare minimum. Now that's a big jump! All that hydrating awesomeness. For reference, I waited twenty minutes before taking the final test. And this is with ONLY the Snail 96. Nothing else. On my face this morning, I used Dr. Jart Cleansing Water, Missha Time Revolution Clear Toner, Dermakey She's Second Aurora, then this CosRx Snail 96. Last was LJH P.Antarctica Cream. My skin moisture levels after four hours? 52%. Yeah, my skin looks hydrated and amazing. The fine lines around my mouth and eyes are gone. Once the hydration levels decrease, they'll come back, of course but for now? Soft, smooth, glorious skin! THOUGHTS: I really, really love this product. I have to admit that I even like it better than the Benton High Content Snail Essence. The price is right, the ingredients are excellent and the moisture it provides to my skin is fabulous. I recommend this product to anyone with dehydrated dry skin, issues with flaking and redness and also with mature skin that needs a little help in the fine lines area. Since there are no oils in this, I recommend this also for oily skin. Not that oils are bad for oily skin but I know they can cause a little fear. Oily skin still needs hydration- water content is different than being oily. If you have troubled skin you'll also find this beneficial because of it's wound healing and anti-microbial properties. Memebox has it for $18 and check the Memebox Deals page for coupons. 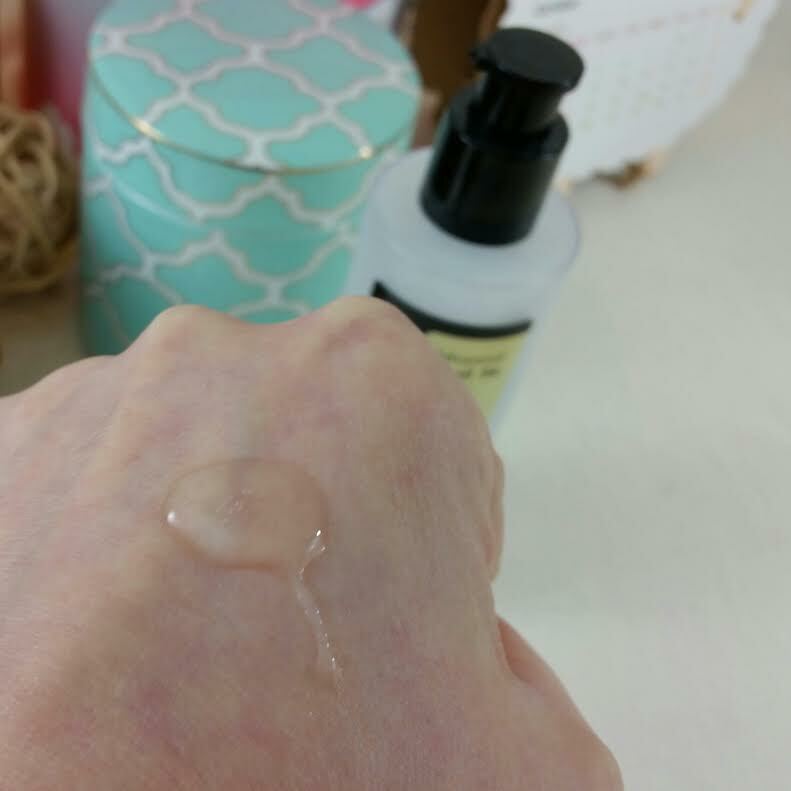 You can also see my review of the CosRx Honey Ceramide Full Moisture Cream here. *I paid for this product myself because I'm addicted to CosRx products. Affiliate links were used in this post. 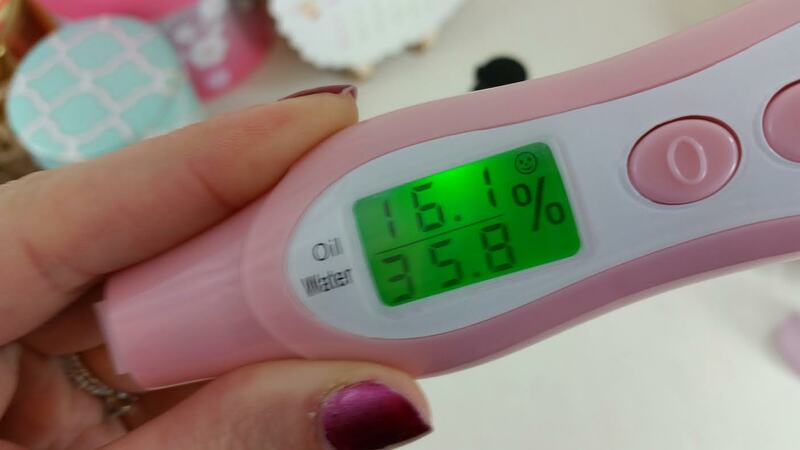 Skin moisture analyzer?!? Who knew there was such a thing?? I need one! You do! I've been playing with it a LOT! Some of my moisturizers are better than others according to this. It uses electromagnetic whatever it's called... the same thing that some scales have. It was $20 on Amazon. Cool, thanks! I just added to my wishlist.